Bike riding offers a form of exercise well-suited to athletes and beginners alike. You can benefit from riding to work, puttering along to do errands or becoming a serious road racer or mountain biker. You’ll burn around 300 calories in 30 minutes of moderately fast cycling of 12 to 14 mph, Harvard Health Publications calculate. Cycling has a high per-minute energy expenditure rate, note Jerrold S. Greenberg and colleagues in “Physical Fitness and Wellness: Changing The Way You Look, Feel, and Perform.” Cycling “can produce tremendous increases in cardio-respiratory endurance, muscular strength and muscular endurance,” they write. Bike riding, along with swimming, is not a weight-bearing exercise, which means that while it does not help maintain bone density or fight osteoporosis, it does spare joints from excess weight some new to exercise might be carrying. Cycle three times a week, for 30 to 45 minutes for each session, and rest on alternate days, Greenberg recommends. Start by riding a mile or two; after a few weeks, exercise at 60 percent of your target heart rate. To calculate your target heart rate, subtract your age from 220 for men and from 226 for women to arrive at your maximum heart rate, then set a rate at 50 to 80 percent of the maximum to arrive at a target heart rate, depending on your goals. Progress to cycling 3 to 5 miles and increase your intensity to 70 to 75 percent of your target heart rate. Once you can cycle 10 to 15 miles, increase your exercise intensity to 80 percent of your target heart rate. Beginners at exercise often choose walking, but walking can get dull and be tough on bones and joints. Bike riding may be a better beginner exercise, according to the HealthyWomen website. 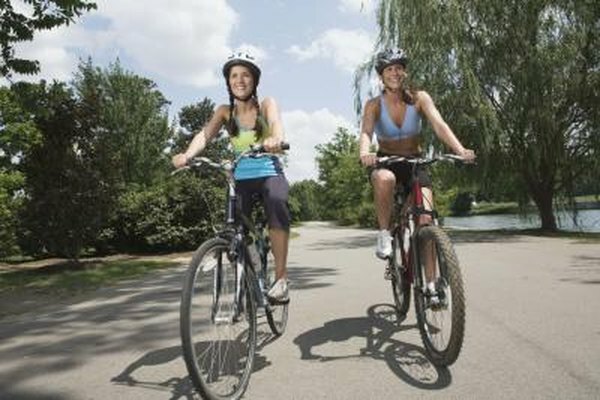 Exercise physiologist Stacy J. Ingraham of the University of Minnesota tells HealthyWomen that bike riding is what health professionals start beginners on before progressing to other activities. Bike riding is an aerobic activity that boosts cardiovascular effectiveness while keeping the heart rate lower than walking or jogging, so you can do it for longer periods. Cycling primarily works the front thigh muscles, or quadriceps and hips, and can be combined with swimming or rowing to work the upper body, the Merck Manuals Online Medical Library explains. Physical Fitness and Wellness: Changing the Way You Look, Feel, and Perform; Jerrold S. Greenberg et al.